I had taken the day off today with the aim of getting out for my first hill walk of the year. The forecast suggested that the eastern Peak District would have the best weather out of my nearby hills so I planned an ascent of Back Tor from the south via Derwent Edge. It had been almost three years since I last climbed Back Tor, but many more years since I had walked along Derwent Edge so it would be nice to return there. After parking the car up between the two road viaducts, I set off walking shortly before half-past ten and ascended up through the woods and out onto the moorland. 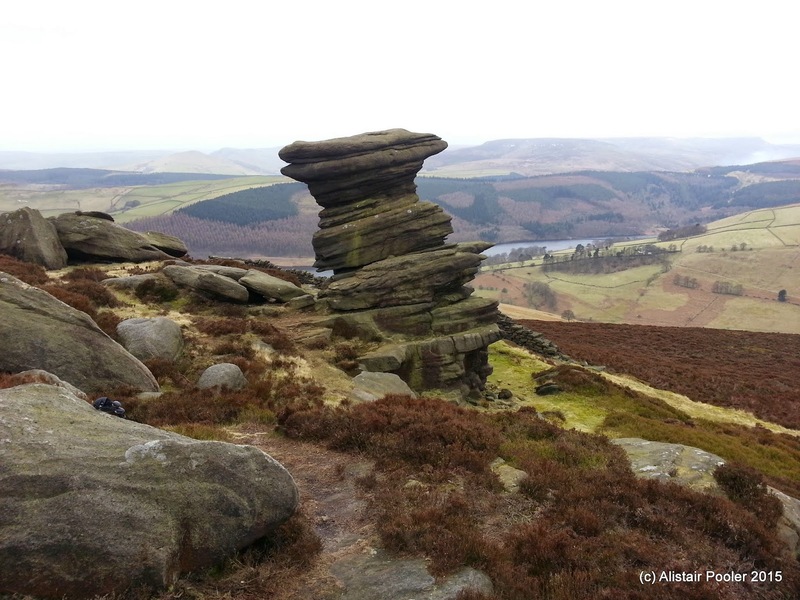 Twenty minutes or so of ascent brought me up to Whinstone Lee Tor, from where there were good views down to Ladybower Reservoir and up the upper Derwent valley. Things had changed up here since my last visit some years ago, with ongoing path improvement work clearly taking place. However there didn't appear to be any work taking place on the path on this windy morning, although there were plenty of bags of rocks and soil around that had clearly been dropped by helicopter. I also spotted lots of little signs, which presumably indicated the planned route of the path. Continuing northwards along the new path along the edge, there were good views down to Ladybower Reservoir and over towards Bleaklow in the distance. At a path junction I came across an informative sign advising me that the footpath work was taking place over the couple of kilometres of path from Whinstone Lee Tor to the Salt Cellar. By now I was getting a little cold due to being exposed to the full force of the bitter wind whilst walking along Derwent Edge. Therefore I stopped in the lee of the Wheel Stones to don a hat and an extra layer! I continued to follow the improved path NW along the edge past White Tor, before detouring to ensure that I didn't miss the impressive gritstone rock known as the Salt Cellar. I continued on past Dovestone Tor and the Cakes of Bread to reach the summit of Back Tor (Dewey) soon after midday. 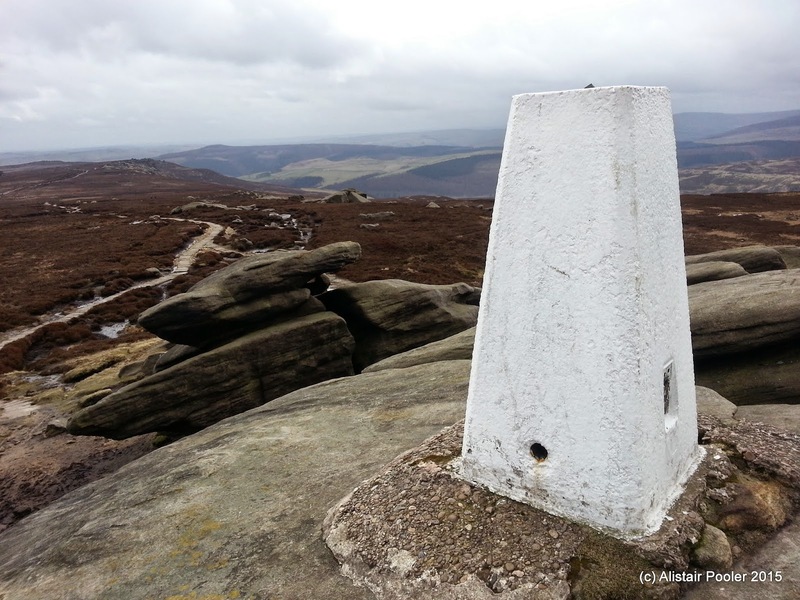 After having a quick lunch in the lee of the tor, I took a quick scramble up to the windy trigpoint on the top of the gritstone tor. There were good views from up here today and there was even a glimpse of blue sky out to the east! Once I was suitably refreshed I headed NW along the slabbed path towards Lost Lad, with good views back towards the impressive gritstone tors. I followed a succession of grassy paths W, SW and S to eventually pick up a reasonable track below Pike Low near a small forest plantation. 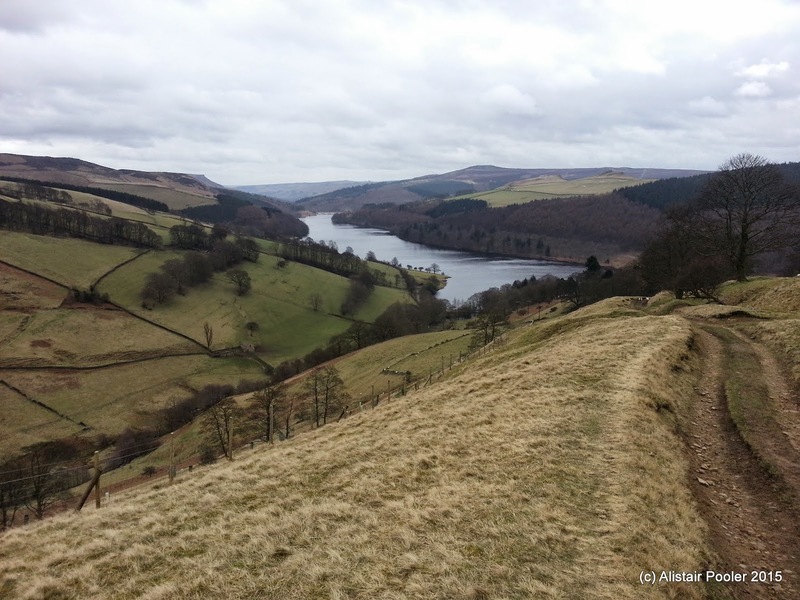 There were good views down to Ladybower Reservoir as I followed the track downhill. Once past a lone house, the path became a sunken track lined with some lovely gnarled trees. Eventually I reached the road along the NE bank of the reservoir near its end close to the lost village of Derwent. The road soon turned into a vehicle track, which I followed SSE past plenty of snowdrops and through some pleasant woodland. Near the end of my walk I came across a robin sat on a old fencepost, which I enjoyed watching for a few minutes before it flew into the nearby trees. Shortly after 2pm I returned to the A57 and my car after a pleasant few hours out in the hills. I was looking forward to my next walk already, which would be the TGOC Spring Gathering walk around the northern parts of Kinder Scout in just a couple of days time :-).